Features a 20" widescreen, flat-panel display. 25ms (black to white) typical response time allows pixels to change colors quickly, so you can enjoy smooth videos. 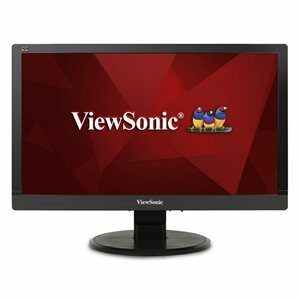 The ViewSonic VA2055Sa features a 20” (19.5” viewable) Full HD SuperClear® MVA widescreen panel. The monitor offers 1920x1080 resolution, 3,000:1 Contrast Ratio, VGA inputs, and a VESA-compatible mount design. In addition, Flicker-Free and Blue Light Filter technology help to eliminate eye strain from extended viewing periods. ViewSonic’s exclusive ViewMode provides intuitive presets to deliver optimized screen performance in different applications. Lastly, with a 3-year limited warranty, one of the industry’s best pixel performance policies, ENERGY STAR and EPEAT Silver certification, and an energy-saving Eco-mode, the VA2055Sa is a great long-term investment for any of your entertainment or professional needs. With an energy-saving Eco-mode feature, as well as ENERGY STAR and EPEAT Silver certification, this monitor delivers great power savings along with its stunning screen performance.